A Daktronics audio system is incorporated with the LED displays to bring uniqueness to the overall experience. 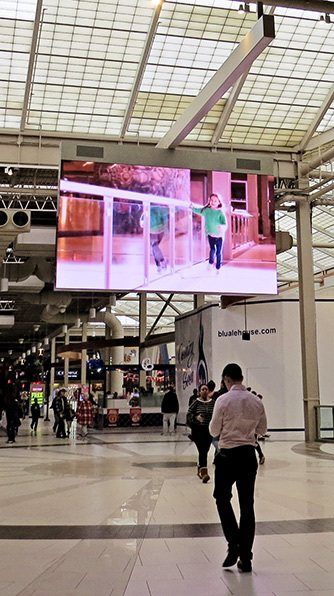 Creating an audiovisual connection with viewers creates a memorable visit to the shopping center that will entice visitors to come back for the in-person experience they aren’t able to receive via online shopping. Palisades Center is the ultimate shopping, dining and entertainment destination in the Lower Hudson Valley, just 20 miles north of New York City. Palisades Center offers over a dozen different entertainment experiences providing something for every age. Drive a race car, climb a ropes course, bowl a few games, or see the latest movie at AMC Theatre. It’s a full day of fun and excitement. Palisades Center offers all your favorite shopping and dining options under one roof. For more information, visit www.palisadescenter.com. Cautionary Notice: In addition to statements of historical fact, this news release contains forward-looking statements within the meaning of the Private Securities Litigation Reform Act of 1995 and is intended to enjoy the protection of that Act. These forward-looking statements reflect the Company's expectations or beliefs concerning future events. The Company cautions that these and similar statements involve risk and uncertainties which could cause actual results to differ materially from our expectations, including, but not limited to, changes in economic and market conditions, management of growth, timing and magnitude of future contracts, fluctuations in margins, the introduction of new products and technology, the impact of adverse weather conditions and other risks noted in the Company's SEC filings, including its Annual Report on Form 10-K for its 2018 fiscal year. Forward-looking statements are made in the context of information available as of the date stated. The Company undertakes no obligation to update or revise such statements to reflect new circumstances or unanticipated events as they occur.